The folks throwing are (from left to right) Dan Haren (in the navy undershirt), Tyler Chatwood (throwing with someone just out of frame), Jordan Walden, a trainer throwing to Haren, Rich Thompson, Hisanori Takahasi’s translator (throwing to Thompson), Takahashi (with his arms out), and Scott Downs. Downs and Takahashi are laughing–at a poor throw by one of them, I think. 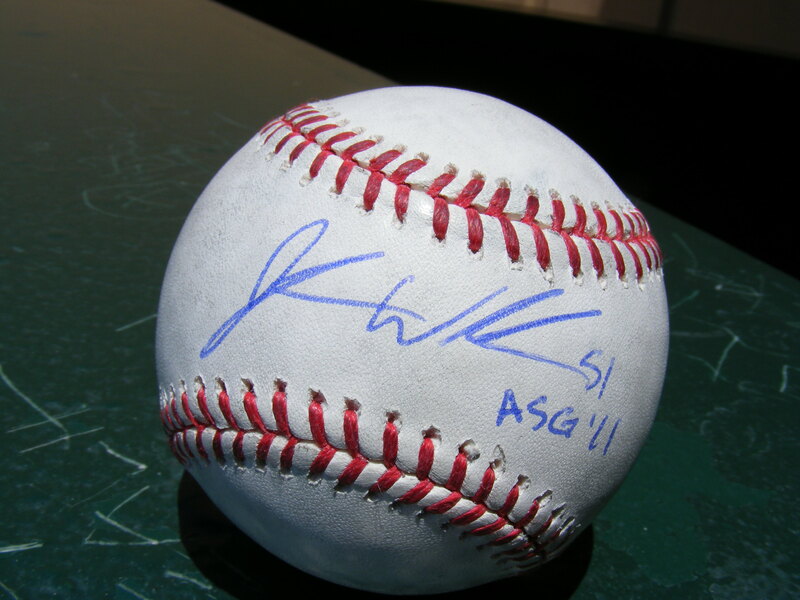 He even put ASG ’11 on it. New. Favorite. 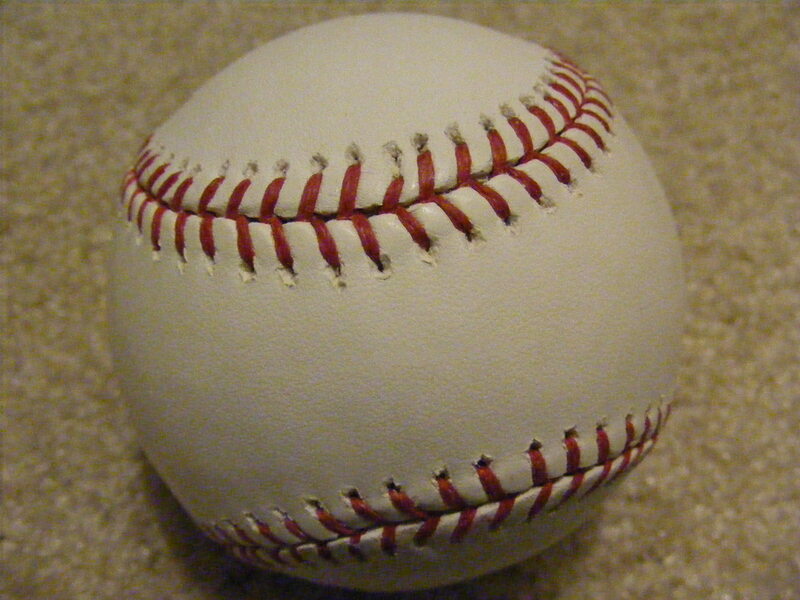 Baseball. The day was a success at that point. I didn’t need to snag another ball or even have a good seat. Heck, the game could’ve gotten cancelled and I’d have gone home happy. 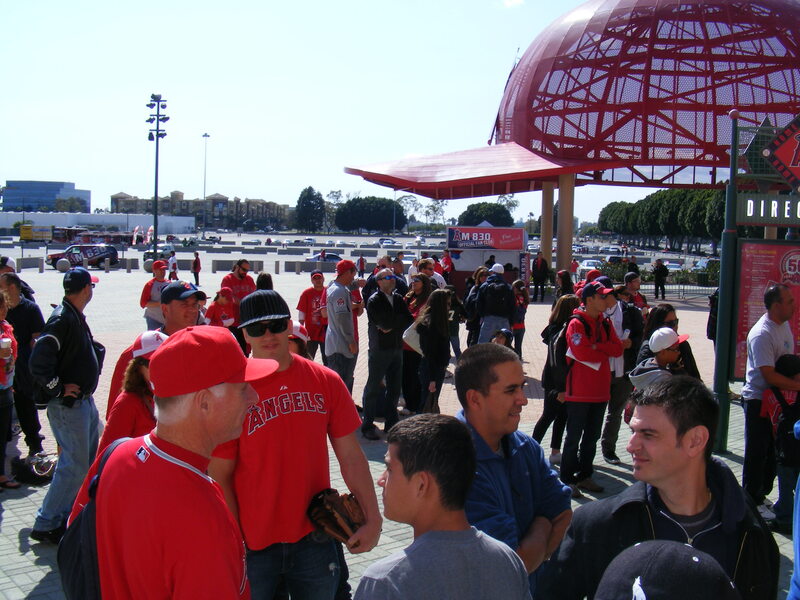 But, thankfully, it was a gorgeous day–the game would be played–and I wasn’t done getting baseballs OR autographs. Hunter was standing to the left of the Summer Concert Series sign (LUDACRIS!) 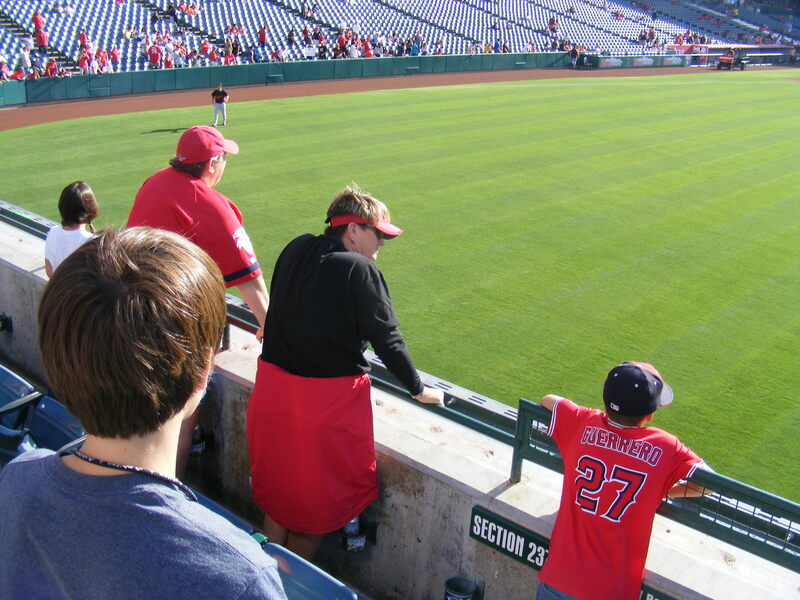 and I was standing to the right of the staircase behind the batter’s eye. Nice arm, huh? 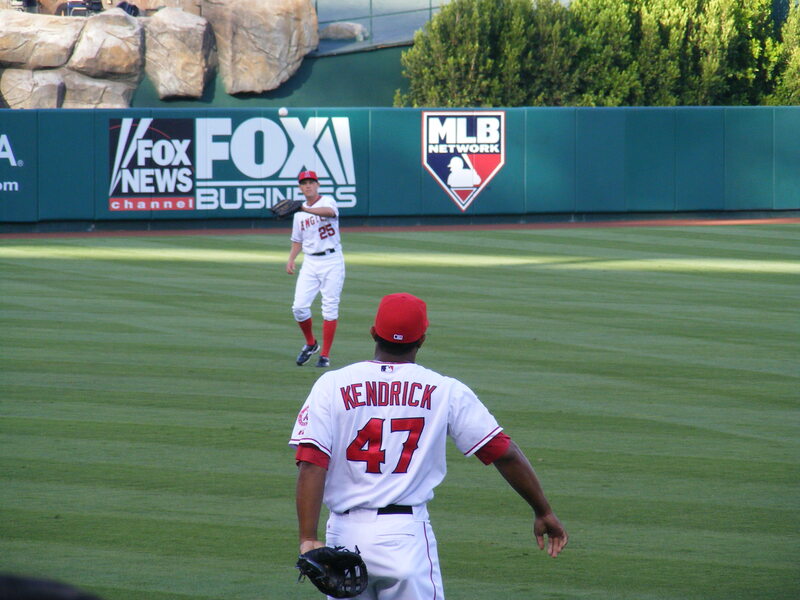 A little later, some Angels came out to throw and after Howie Kendrick warmed up he tossed his ball… to someone else. 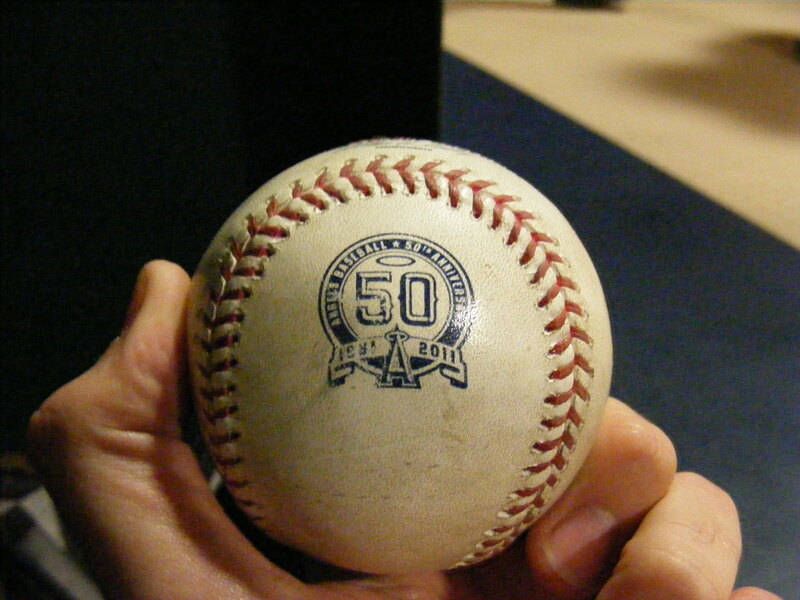 But then he went to the ball bag and pulled out two brand new 50th baseballs and one went a section to my left, the other one went to me… someone tipped it and I had to pick it up off the ground… but it was still in great shape! 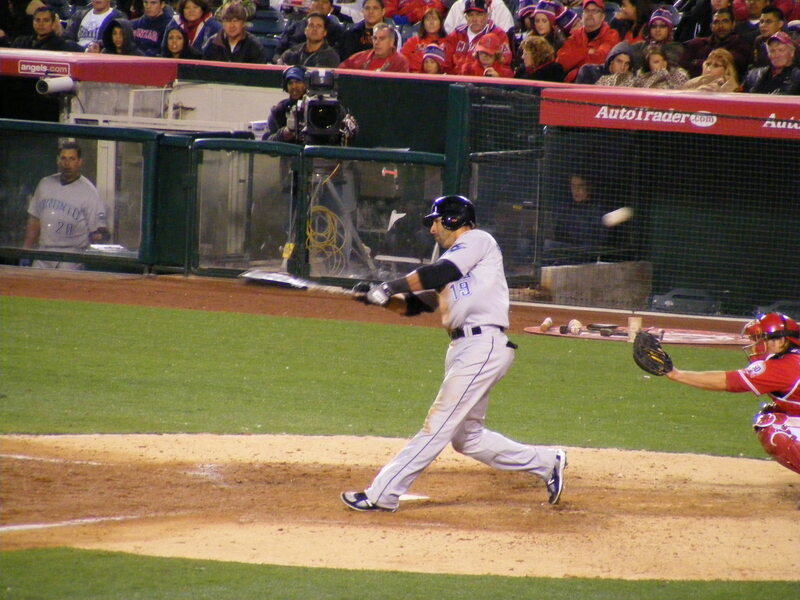 The spot of the catch can be seen in the photo to the right. 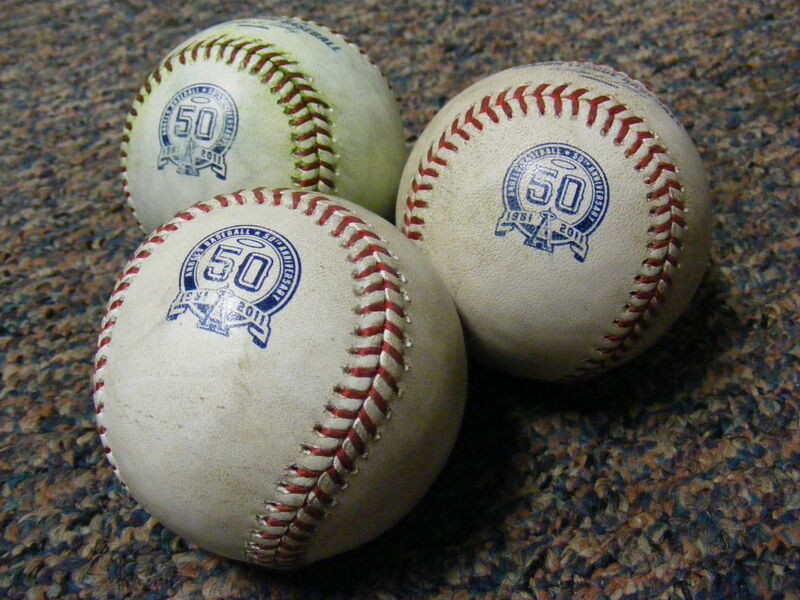 All three baseballs were commemorative. Yay! 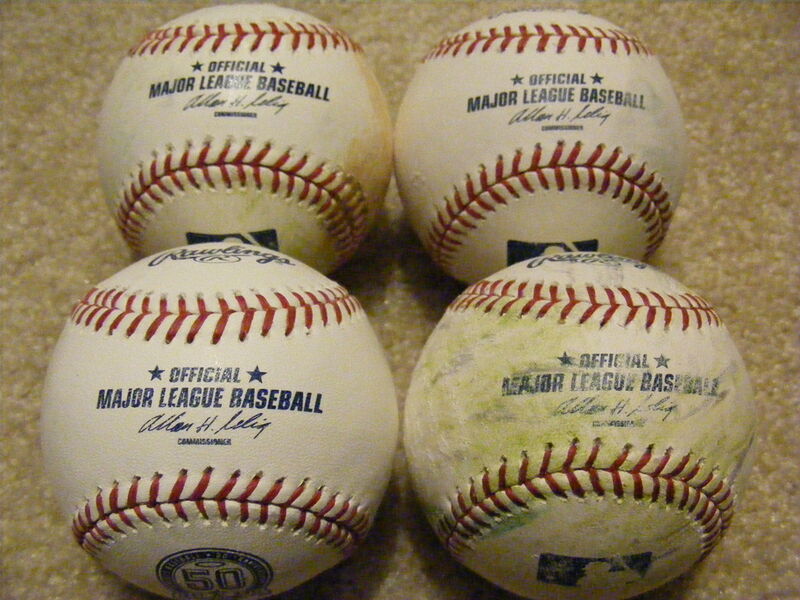 Before the game started I had gotten five autographs and three baseballs–with no BP! And I was all set to enjoy a fantastic pitching matchup. 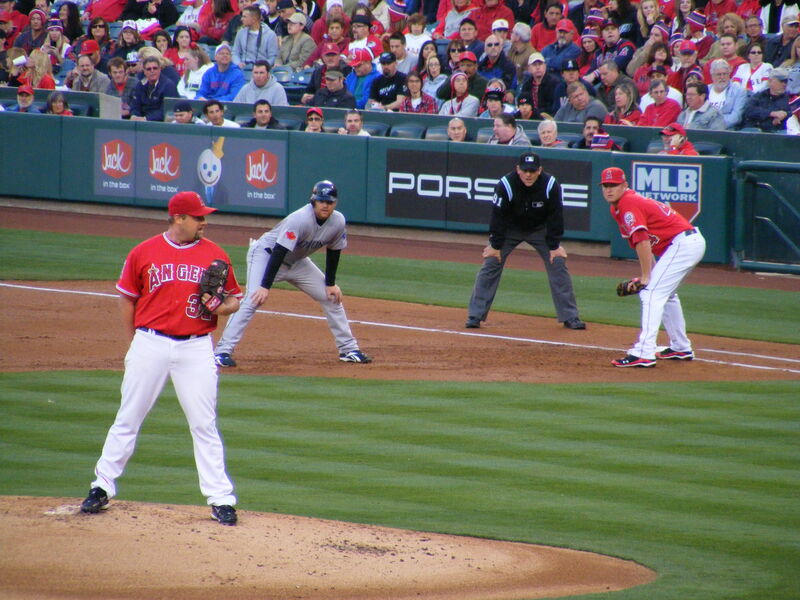 Jered Weaver vs. CJ Wilson. 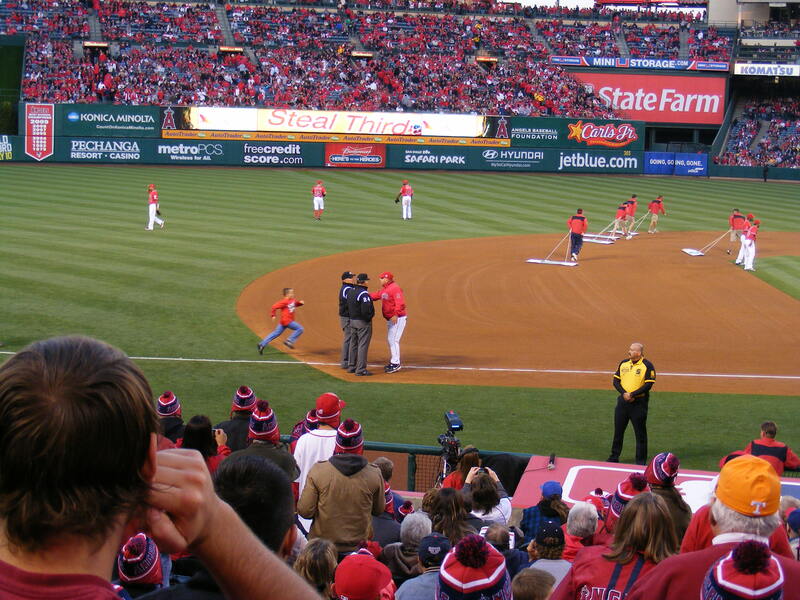 Since it was a day game and attendance was lighter than usual, I was able to jog back and forth between the home dugout and the visitor dugout for each inning. Unfortunately, the two starters were striking guys out left and right and I was almost always on the wrong end of the dugouts. It was frustrating–but at least I was getting my cardio workout for the day. 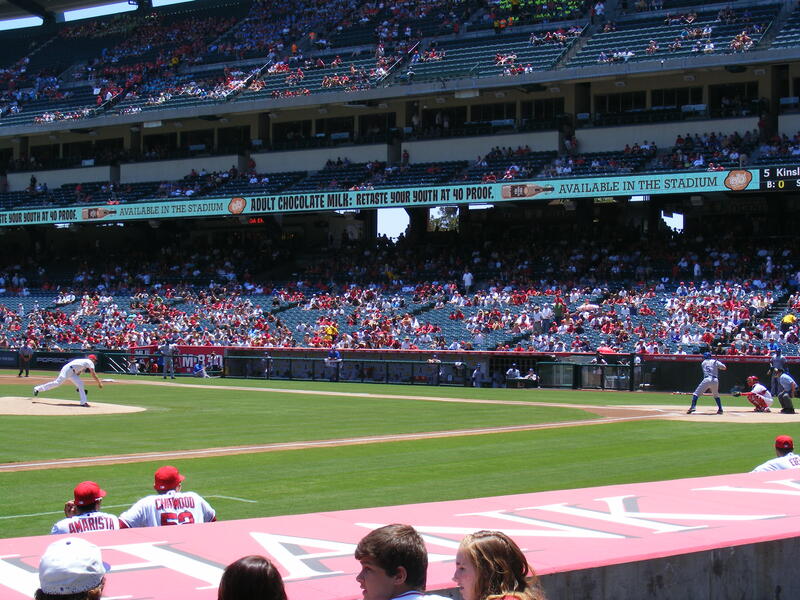 In the second inning the Angels managed to score a run without getting a hit thanks to an error by Endy Chavez in center field. 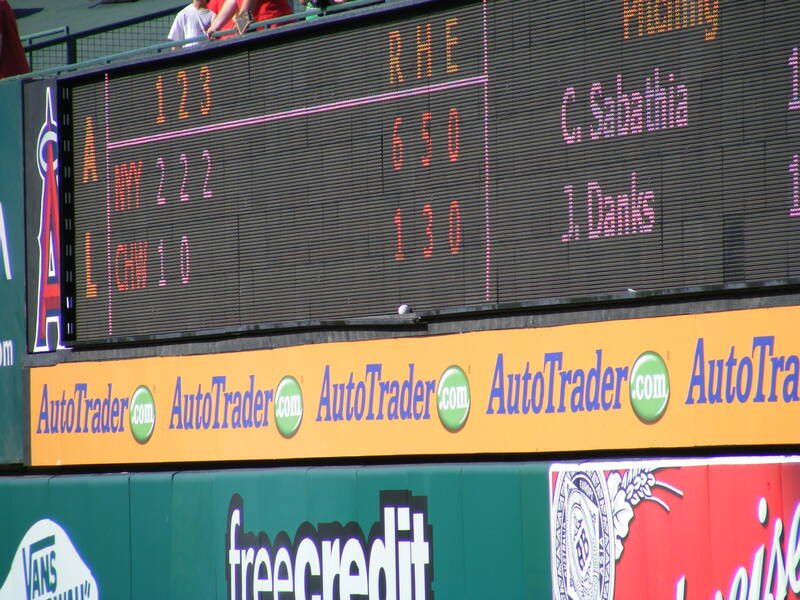 I took a photo (left) of the scoreboard to mark the occasion–it was a pretty important run. 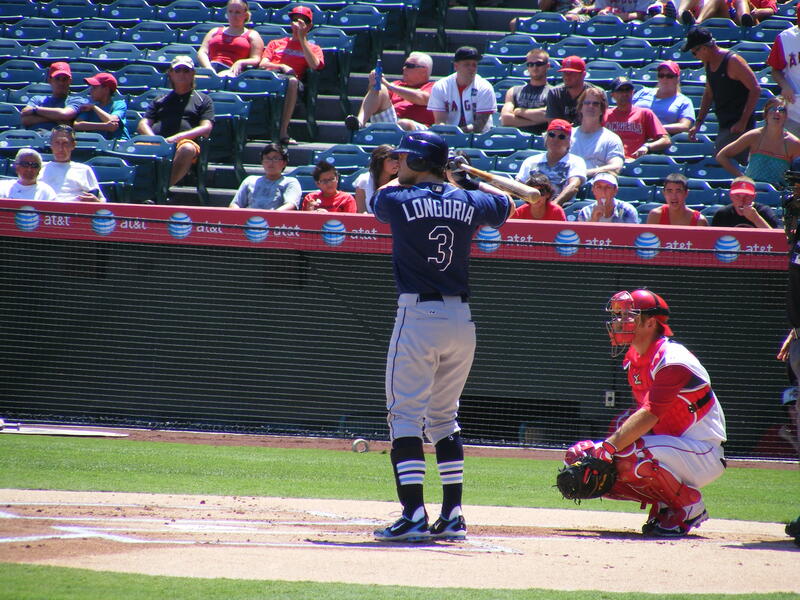 Um… that half of a third base coach is due to my panorama-making software. Hmm. And he went back out for the seventh before giving way to Scott Downs in the eighth and then Jordan Walden (my new best friend) in the ninth. Remember that one unearned run? That was the only run of the game! 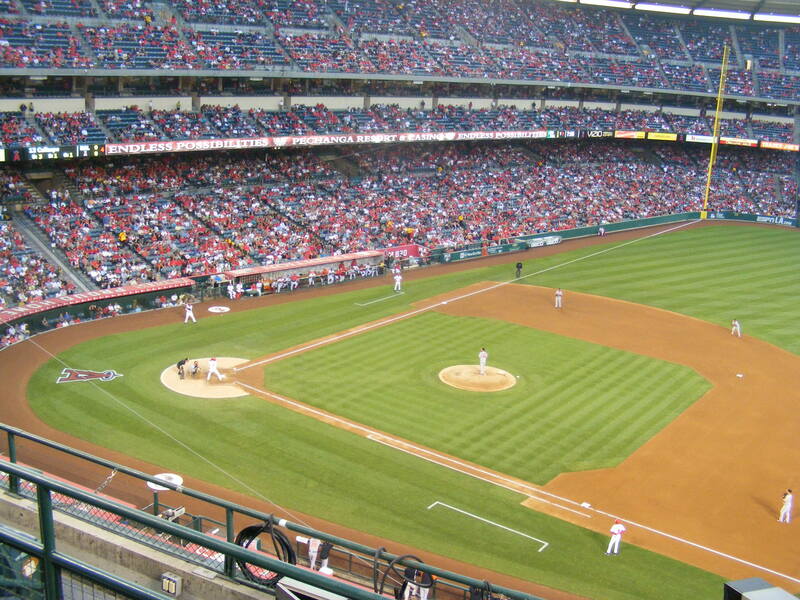 And the Angels got the win, 1-0. I didn’t snag anything else once the game started but I still had a blast. Finally! 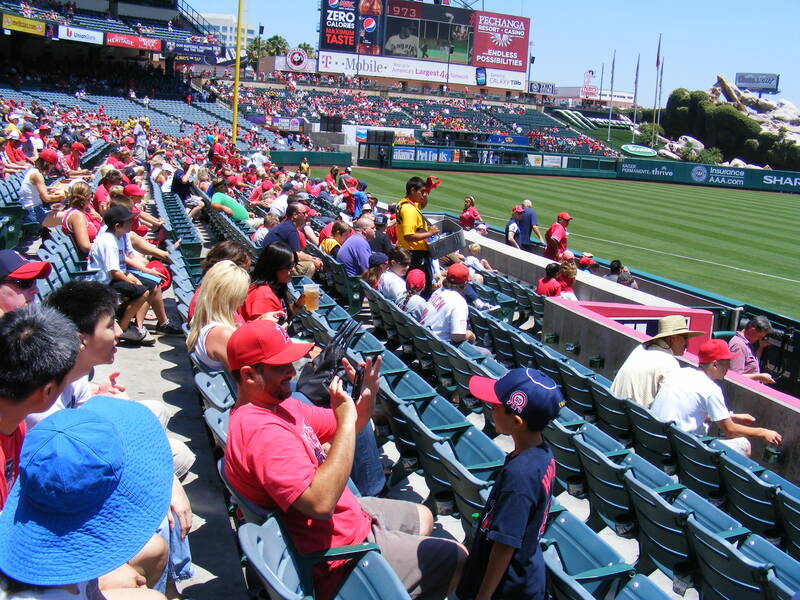 My first regular season game at good ol’ Angel Stadium… and there was a good crowd on hand as I waited (along with a few other ballhawks) for the gates to open at 4:00 for the 6:05 game. But, the horror! 4:00 came and went and the gates didn’t open… 4:10… nothing… 4:15… finally, some movement at the gates and we were allowed to pass through security. 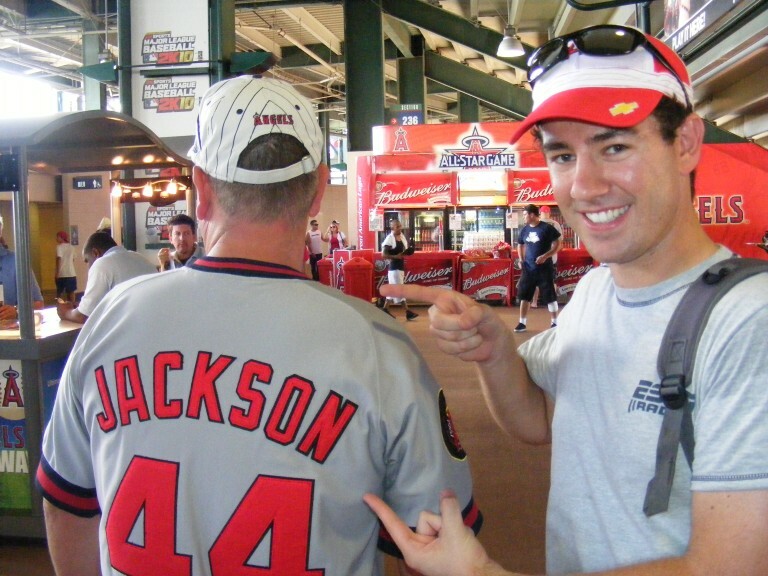 When I got up there I encountered something I hadn’t seen at a ballpark since the late ’90s. They tore my ticket… tore the bottom of it right off along the perforated edge. Weird. I found out later they were having scanner issues… and after keeping us waiting for fifteen minutes they knew they just had to let us in. 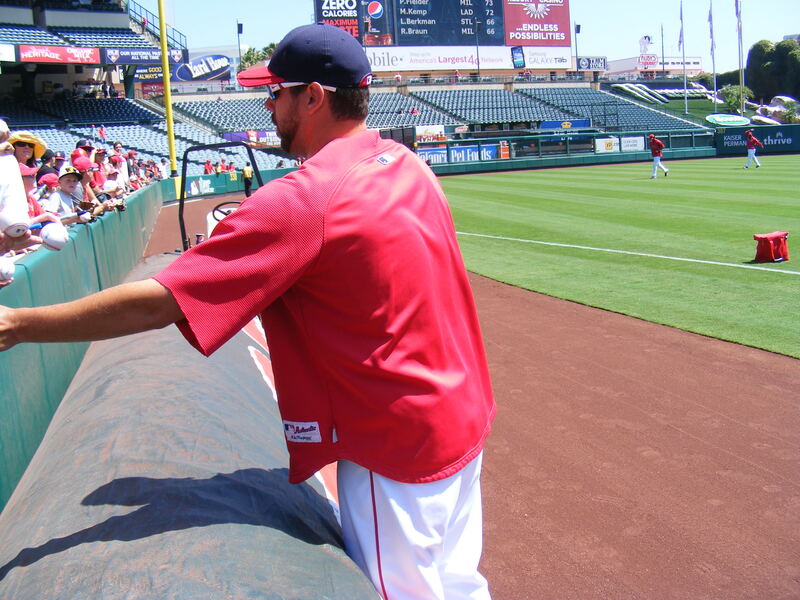 Thanks, Angels management, for not waiting until who-knows-when to let us in. 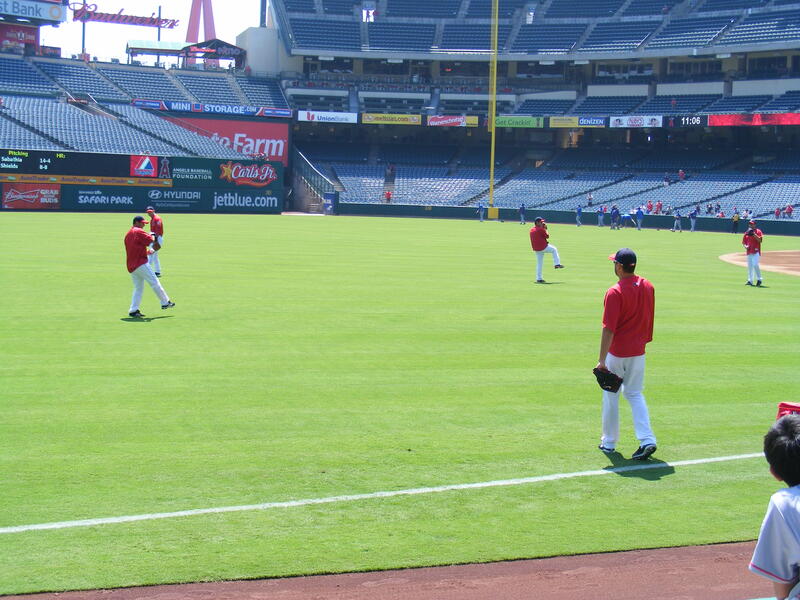 I ran in and the Angels were in the midst of BP. 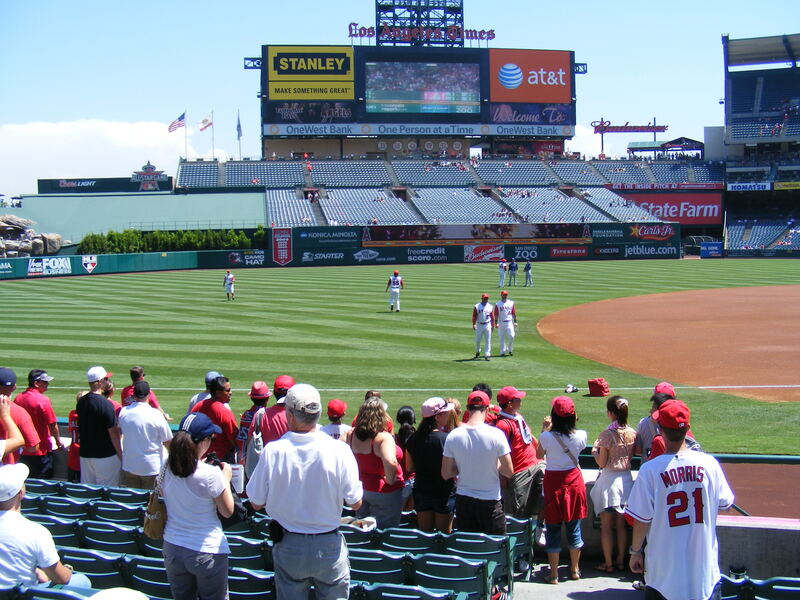 My first destination was the right field pavilion. And, wouldn’t you know it? 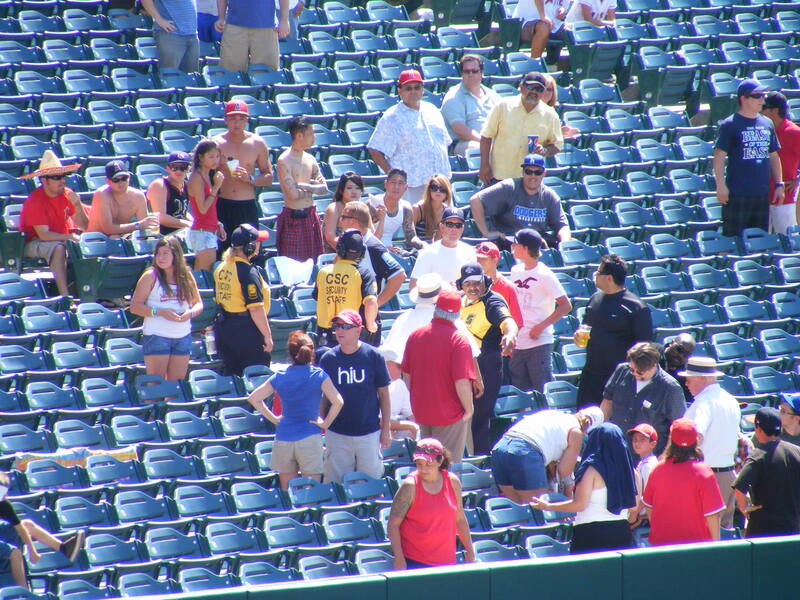 In the twenty or so minutes the Angels were hitting only one baseball flew up to the pavilion… and BP regular Rob ended up with it. 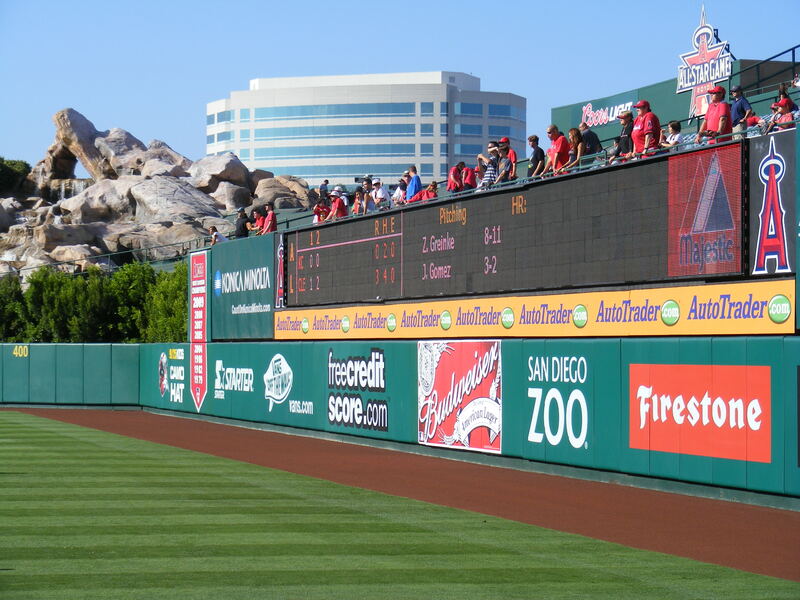 Mark Trumbo sure hit some bombs to left field and center field, too! 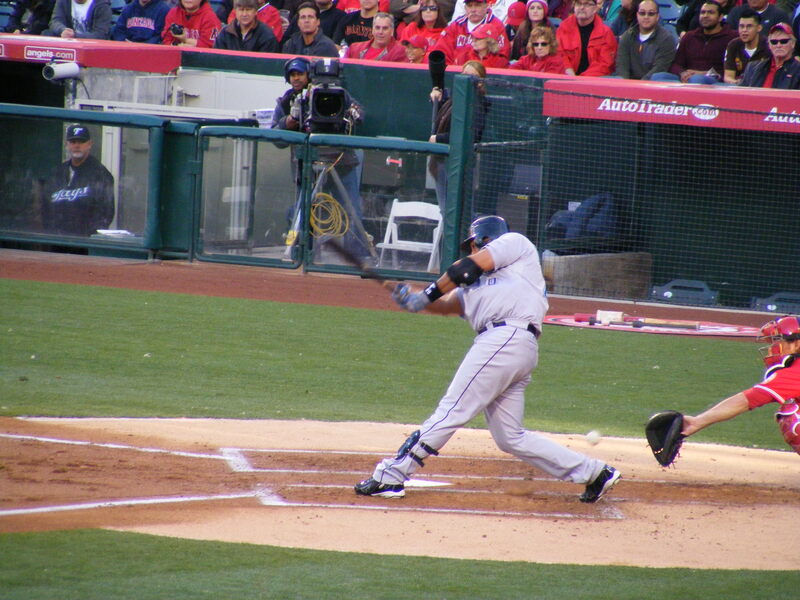 Without Kendrys Morales in the lineup the pavilion loses a bit of luster in terms of catching baseballs… though Trumbo will occasionally get one up there, I hear. Jose Bautista was up in the first group of Jays hitters so I moved to left field. 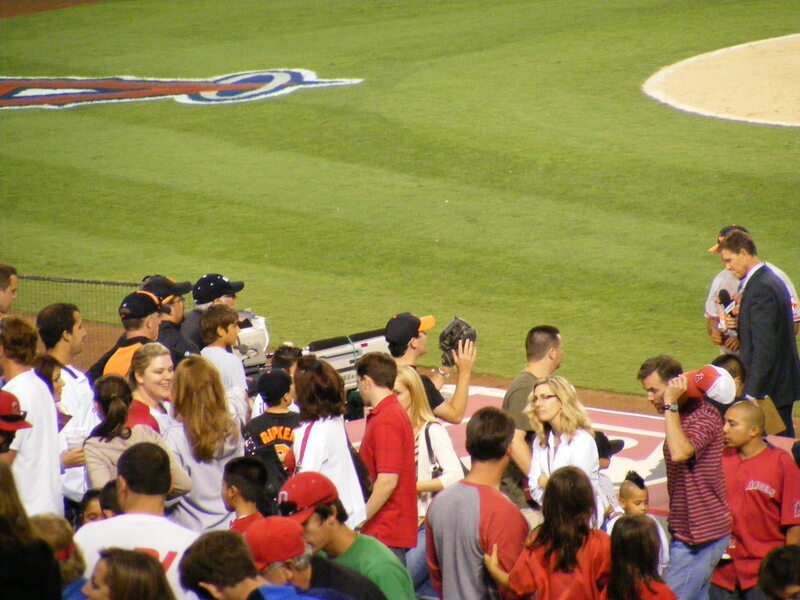 Well, the guy on the right (who I don’t recognize) threw me a ball while I was in the tenth row of the section. I ended up giving that one away to an usher and told her to find a kid to give it to for me. 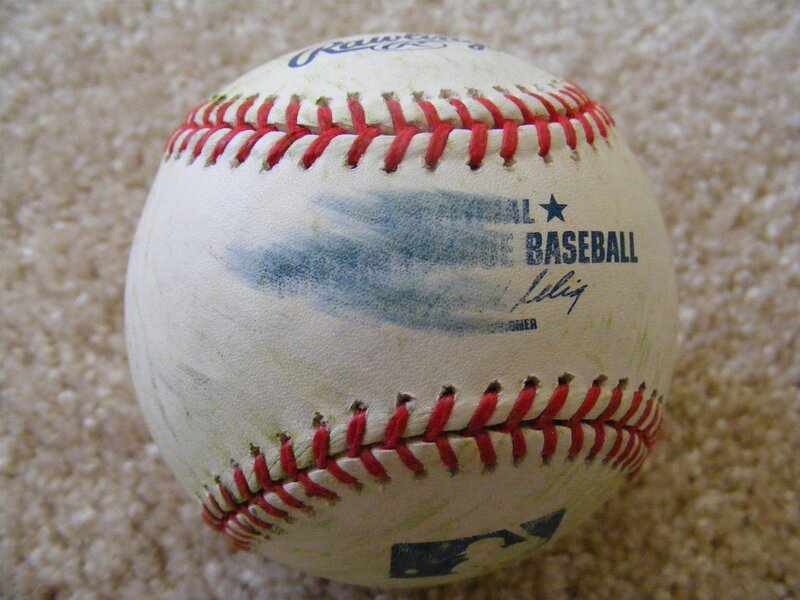 For that transaction I was back in right field for the few Blue Jays lefties–again the pavilion wasn’t kind to me. 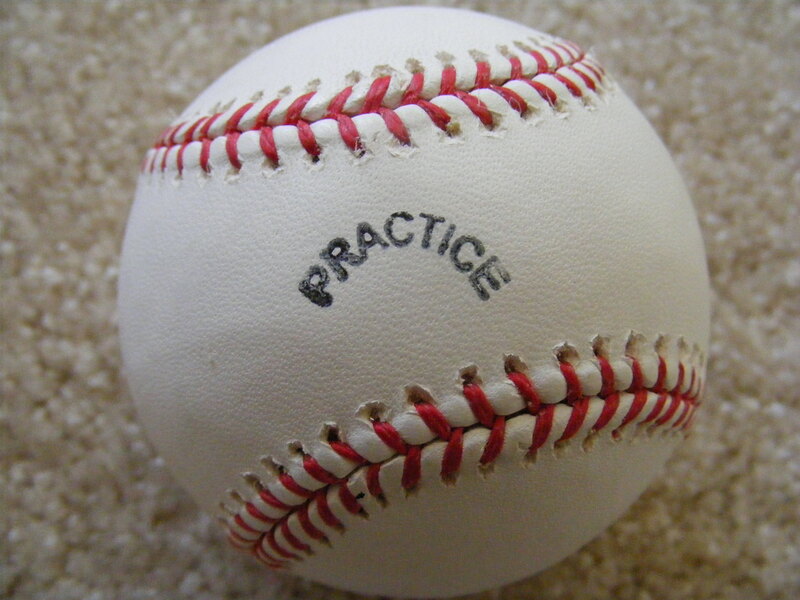 I’d end batting practice with just two baseballs. 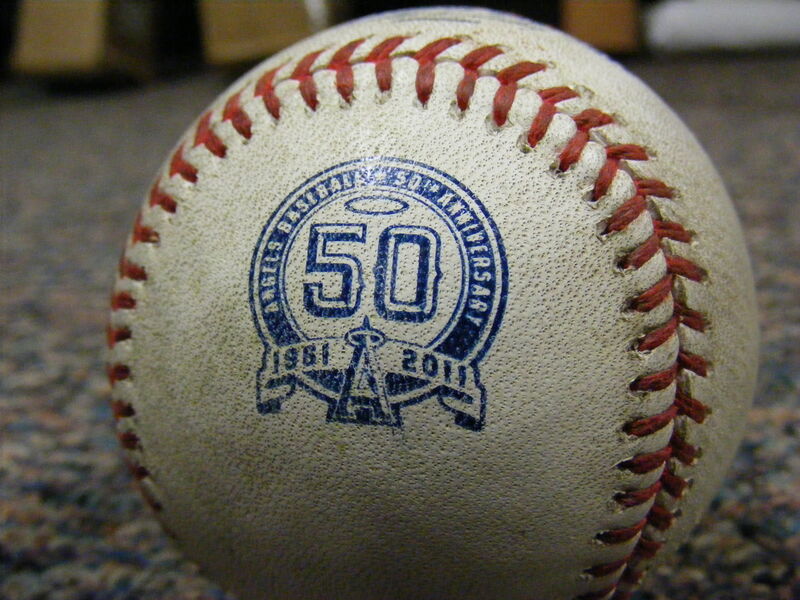 I tried for a ball during the Angels warmups and then again on the Blue Jays side for theirs… no dice. YES! 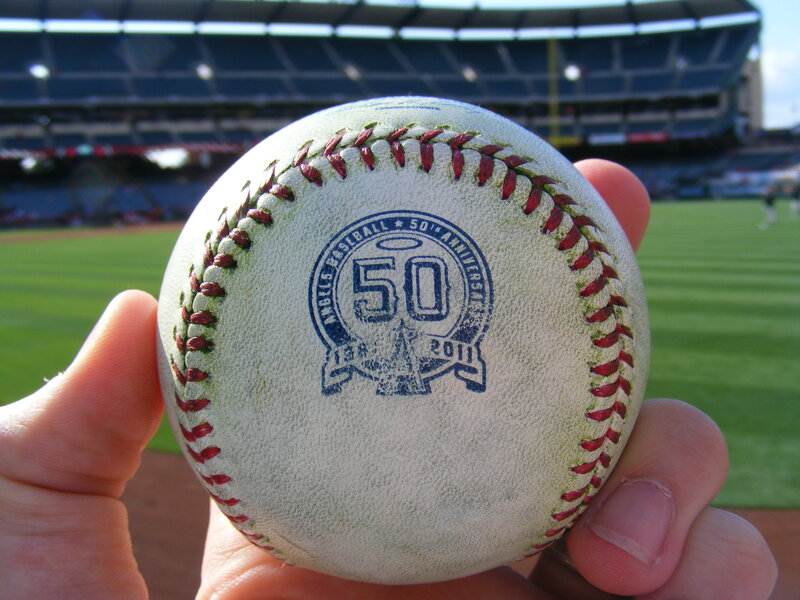 A rubbed up game ball from the Angels–commemorative! 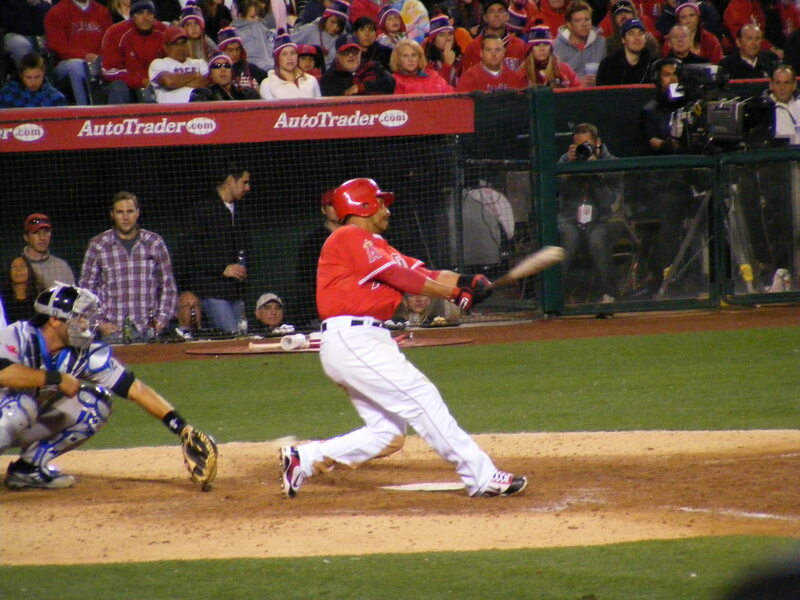 From Mathis to Trumbo to me–I was thrilled and I didn’t care if I caught another ball all night. 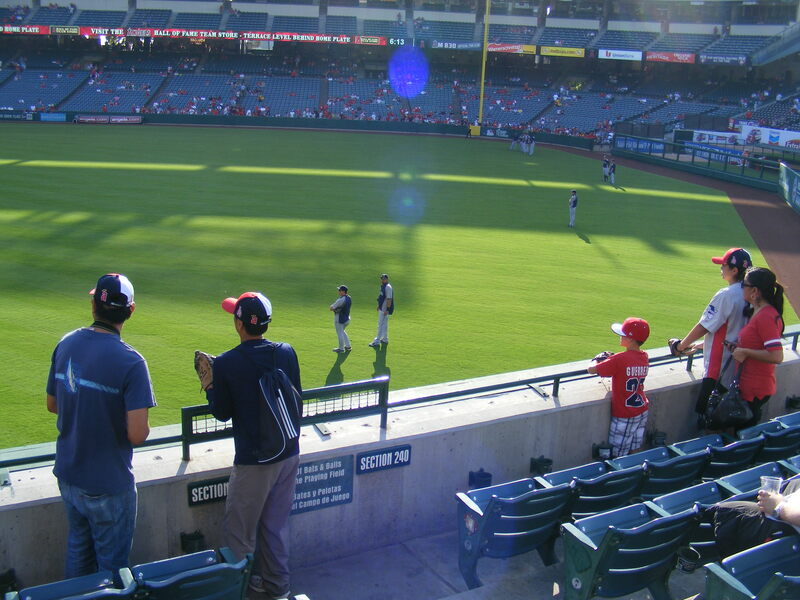 OK, maybe that’s not true… I tried for a foul ball or two as they came near me. When my uncle arrived, who had ended up giving me a ticket to the game, I told him on the phone I wasn’t near our ticketed seats. He joined me near the dugout. Did I mention it was beanie night? I am definitely more excited about my beanie than he is about his. 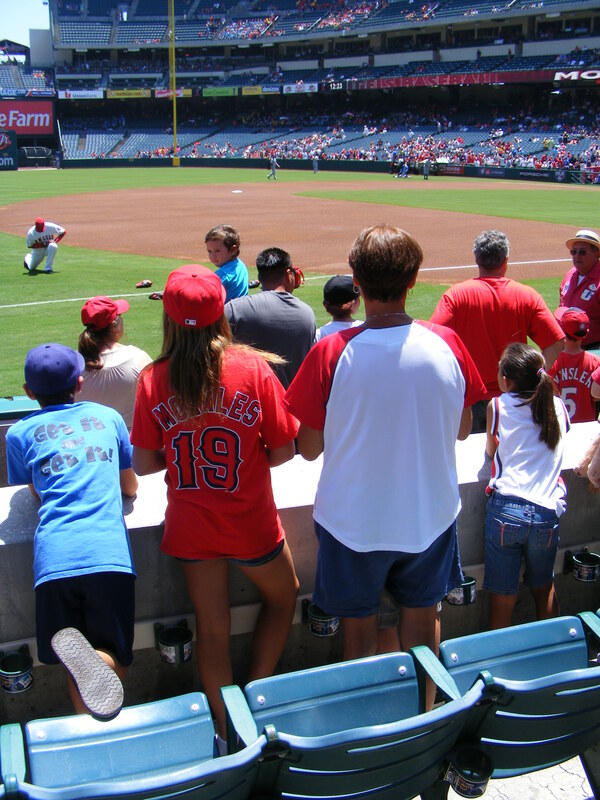 My uncle, Ivar, is the one who first started taking me to Angels games and the one who took this photo that I wrote a whole blog entry about. I know a lot about the game based on my uncle taking me to a bunch of games as I grew up and I am thankful for that now. me time with him and chat about the game and baseball in general. 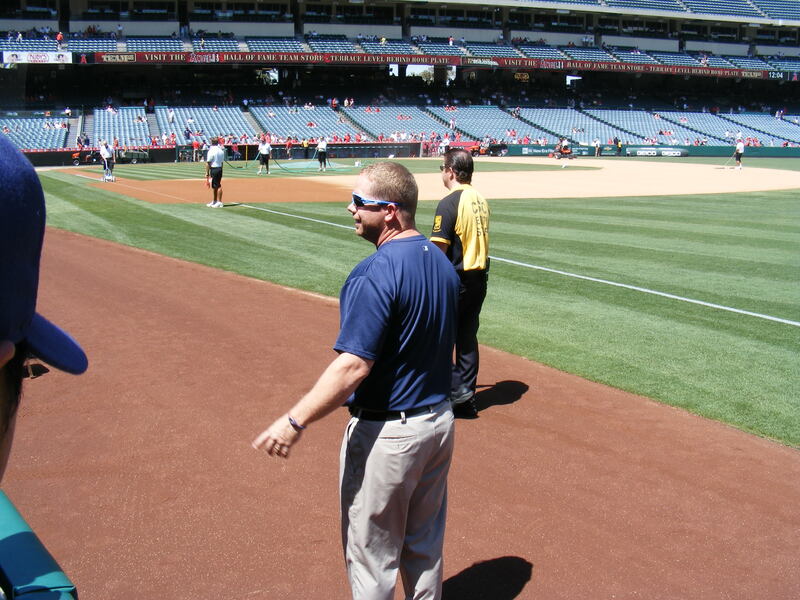 One inning, as I tried for a third out ball again he snapped this photo (left) of me running back to “my” seat from the dugout. I didn’t get the ball but I had fun trying. … and batters swung at pitches and fouled them off and pitchers came into the game… I stayed right where I’d been with my uncle. … except after the seventh inning stretch when I ran over to the Blue Jays’ dugout. 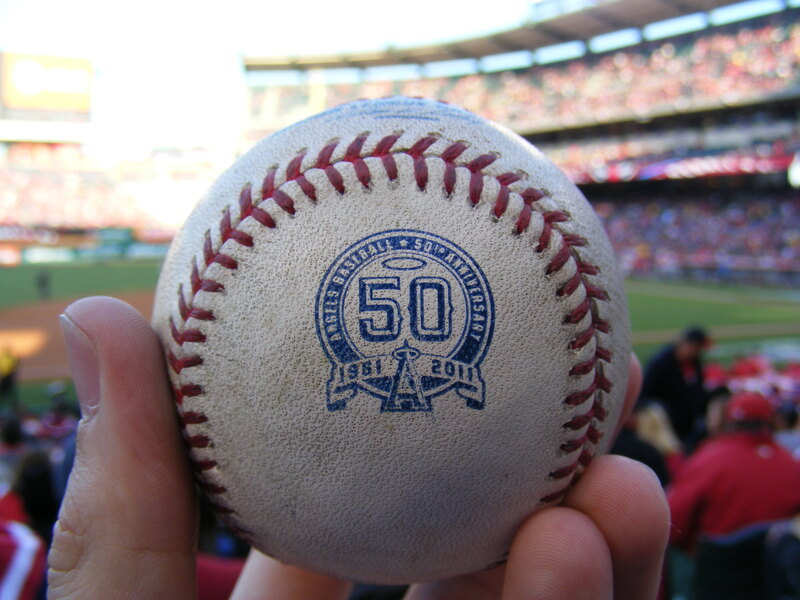 And I took some photos–but the main event over on that side was when Howie Kendrick grounded into a double play to end the seventh inning and Adam Lind tossed me the rubbed up gamer at the dugout. 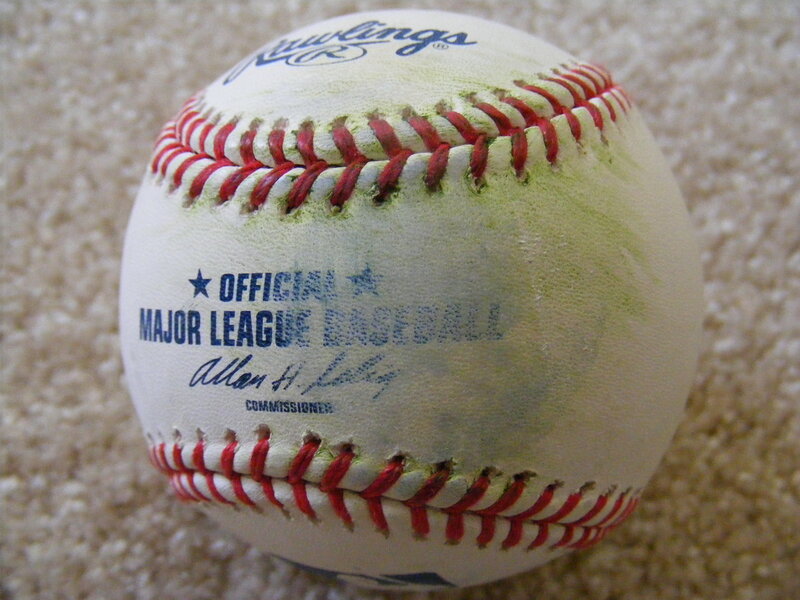 It has a grass stain from the trek it took through the infield and a bit of wear over the 1961 on the logo… not quite as clear as the Trumbo ball… but I’ll take it! 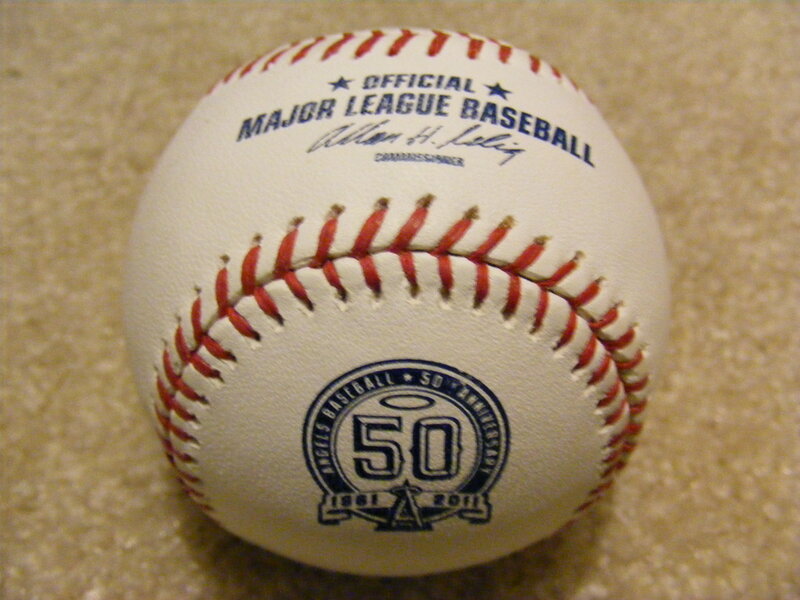 That was my fourth ball of the night–and the third commemorative one. 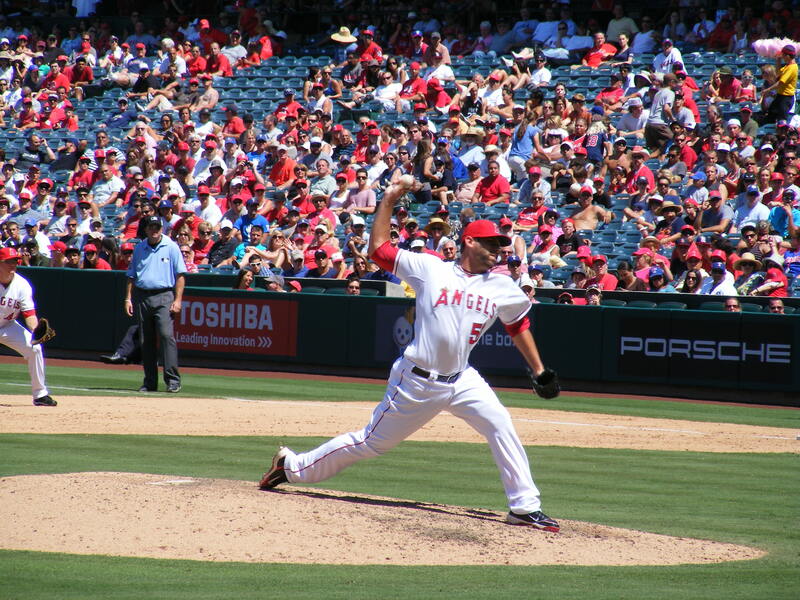 Jordan Walden came in to keep the score tied in the ninth and did his job–he looks sharp as the Angels’ new closer with Fernando Rodney setting him up. Yep–I did. Grown-up responsibilities and such. 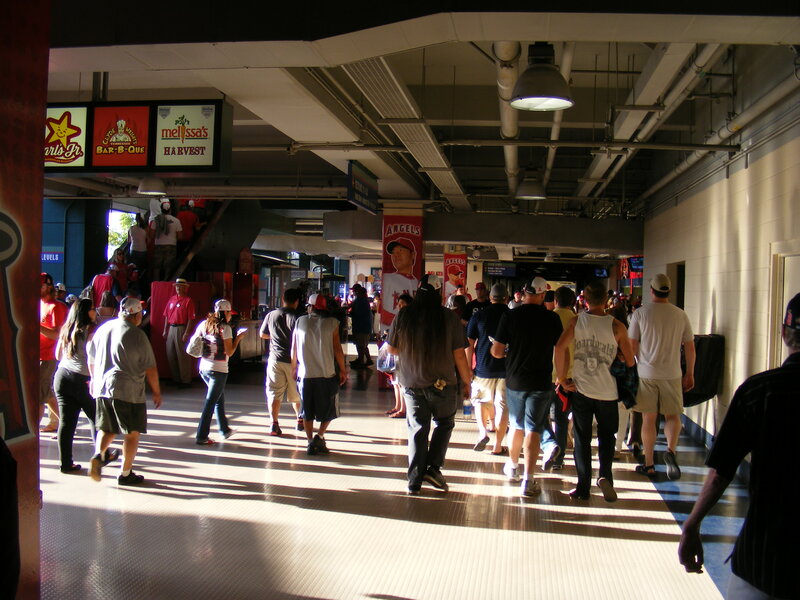 He took this picture (right)as we headed out of the stadium. 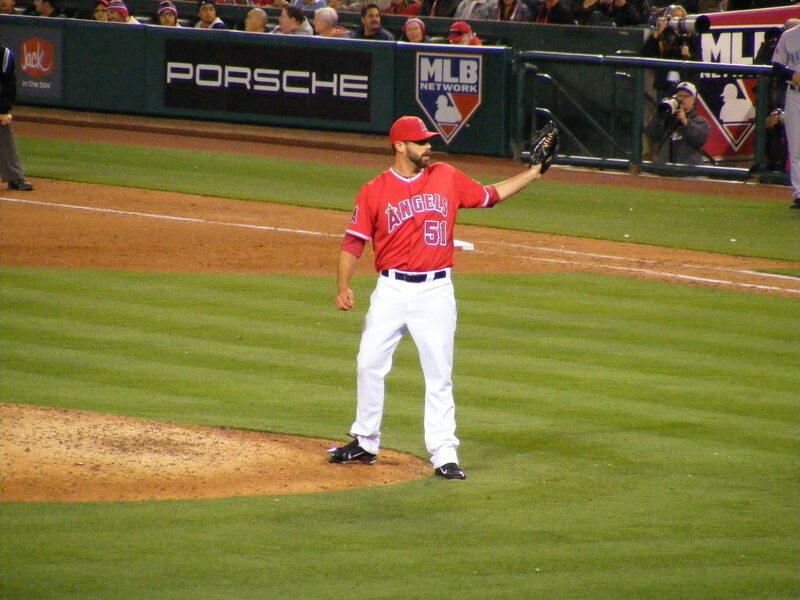 We heard the end of the game on the radio on the way home, a 6-5 Angel victory after over five hours of play–in the 14th inning. 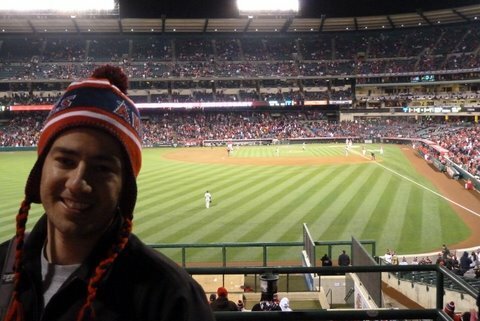 After losing two of three to the Rays I was hoping that the Angels could keep some playoff hopes alive by beating up on the Orioles. 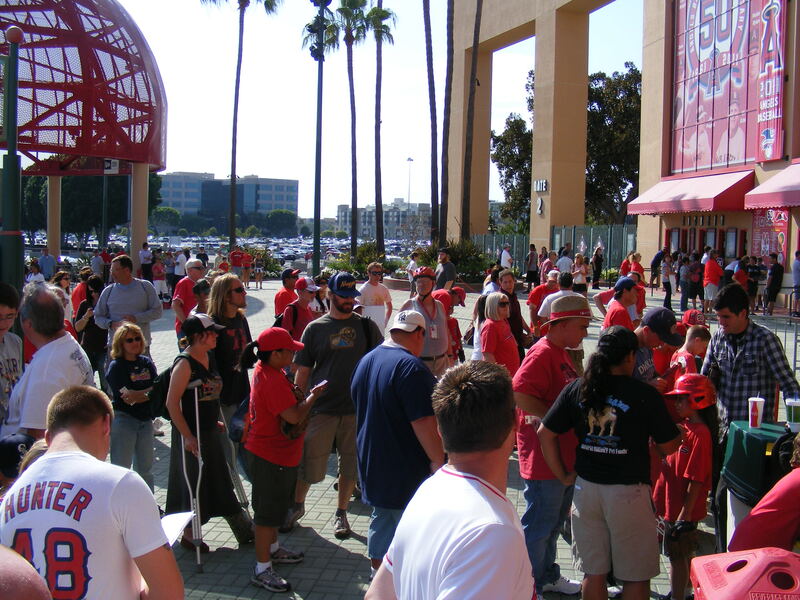 It was a cool Saturday afternoon in Anaheim, and my sister-in-law and her boyfriend would be meeting Michelle and I at the game. When the gates opened I ran in and set up shop in right field. I was hoping to catch a homer on the fly for my first baseball of the evening but I settled for a ball from new reliever, Jordan Walden. BP regular Devin had a ball glance off his glove and fall back to the field… I happened to be nearby and asked Walden if he could spare it. He could–and I was on the board. Bleh… a big ol’ PRACTICE stamp. 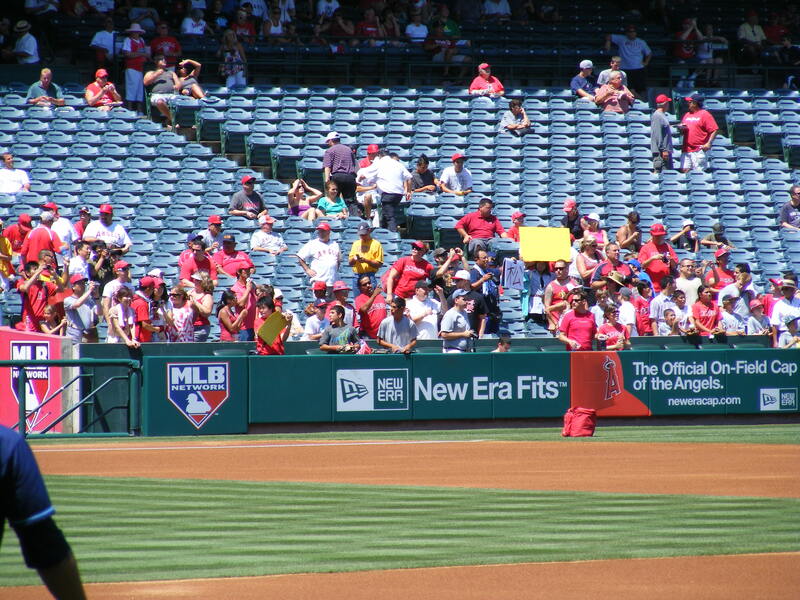 I went down to the corner in right for the remaining portion of Angels BP. And didn’t catch a darn thing. 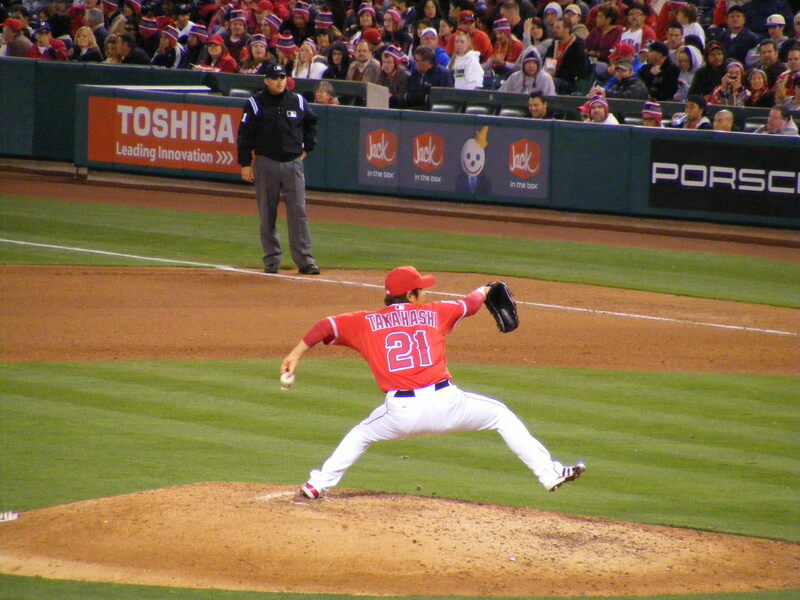 But here’s a photo of Walden, who throws 99 MPH, by the way. 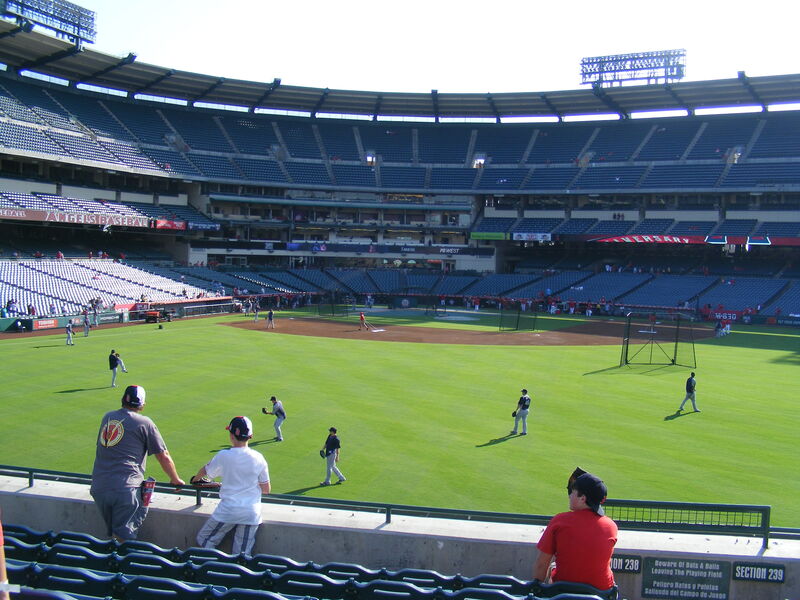 The Orioles came out to throw and I watched them from field level as the Angels finished up their portion of batting practice. 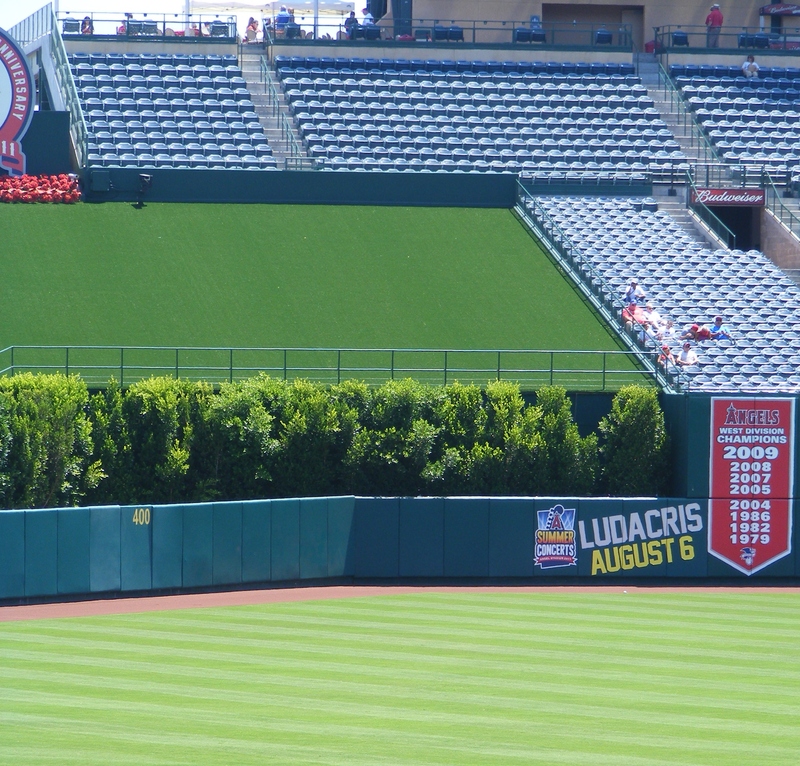 Before BP ended I had noticed a ball that got hit to deep right field, hit the wall… and stayed there. Can you see it? 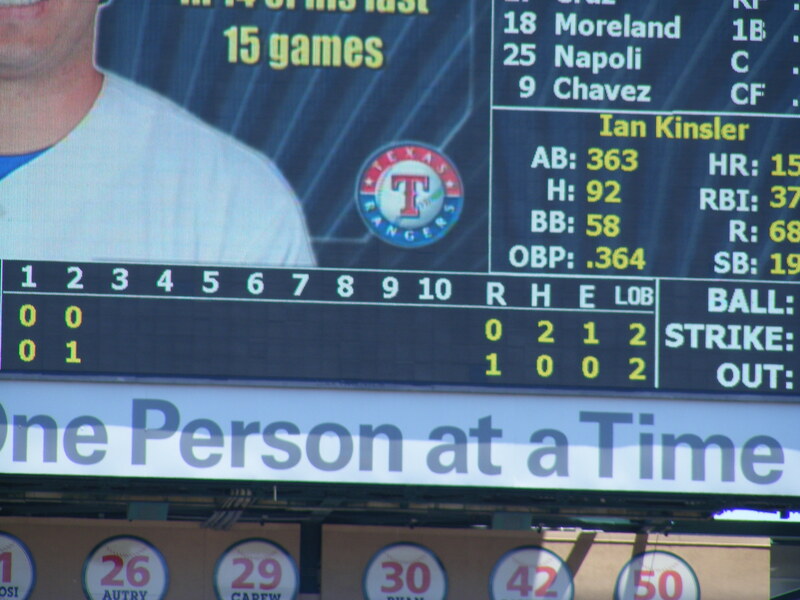 It got stuck on the bottom of the scoreboard… I’d never seen that before. 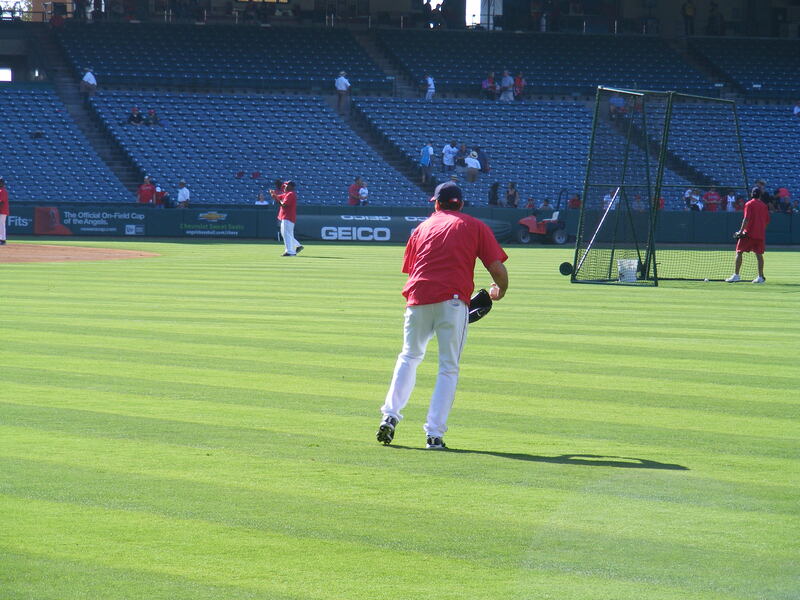 Anyway, that was it for batting practice. 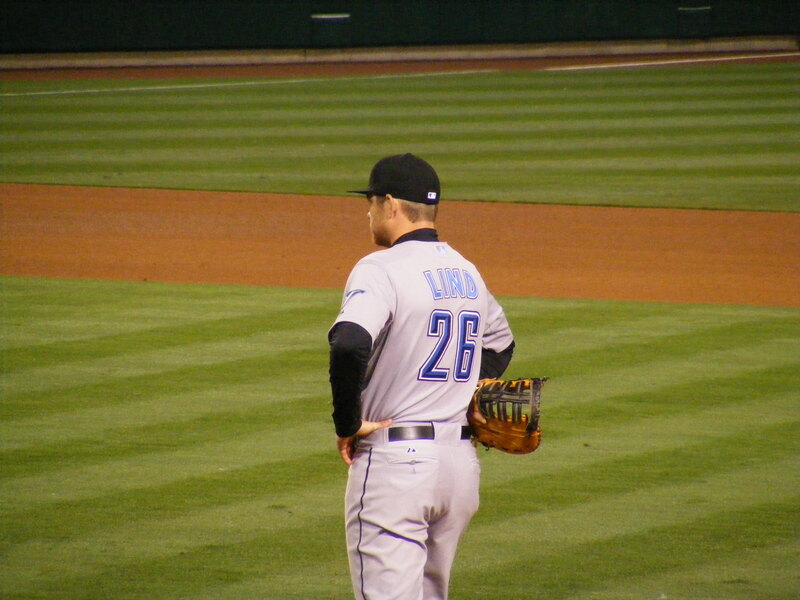 I was a bit frustrated… I didn’t even get anything at the O’s dugout. 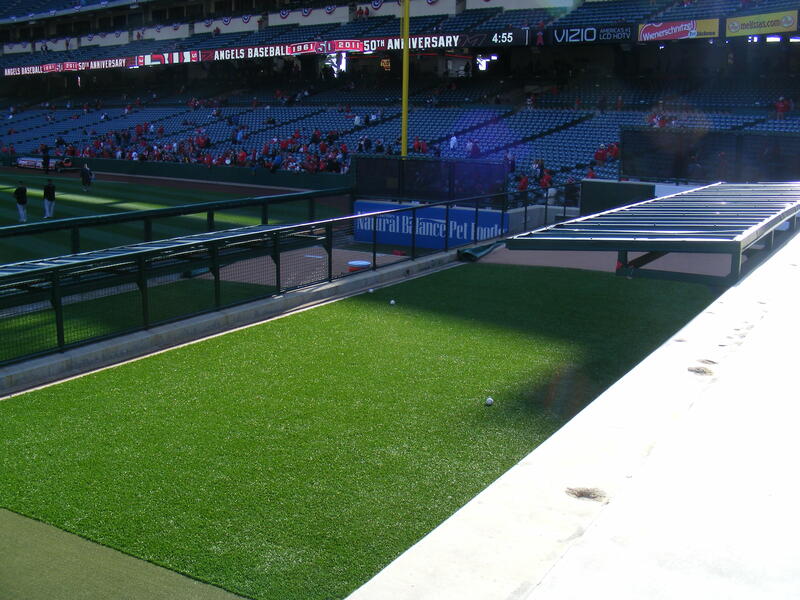 So, I chatted with my group (who’d all arrived by that point) and we walked over and found a place to sit down over third base as the Angels came out to throw. 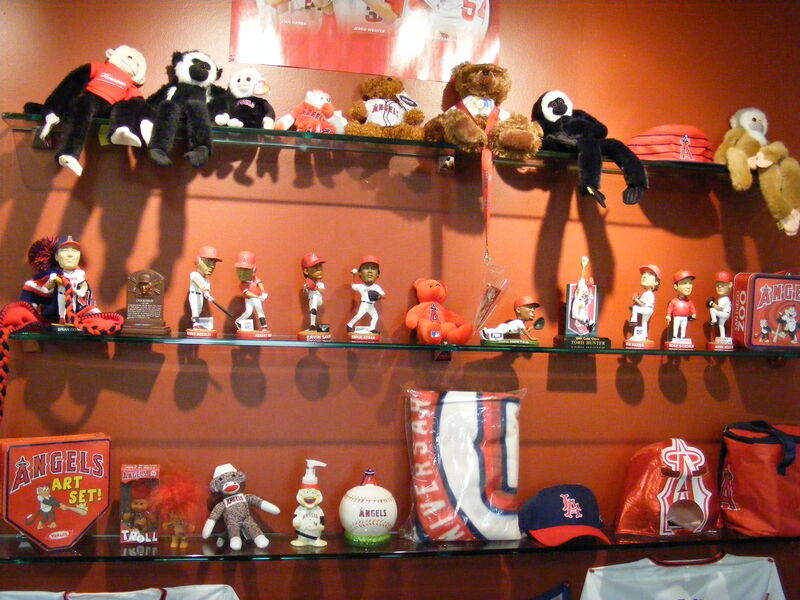 Peter Bourjos and Erick Aybar ended up with baseballs after they were done throwing… and when Bourjos threw his to someone a section away I turned my attention to Aybar. 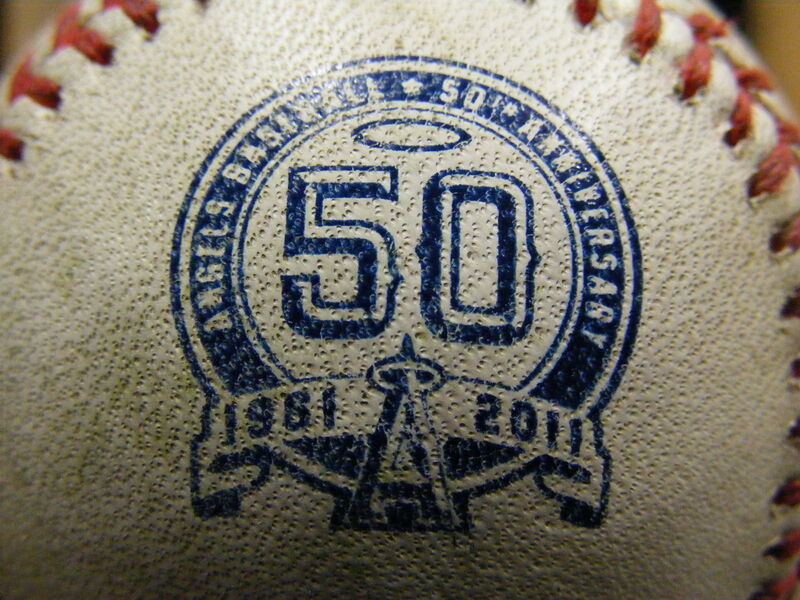 Then, out of the corner of my eye I saw a baseball floating through the air. 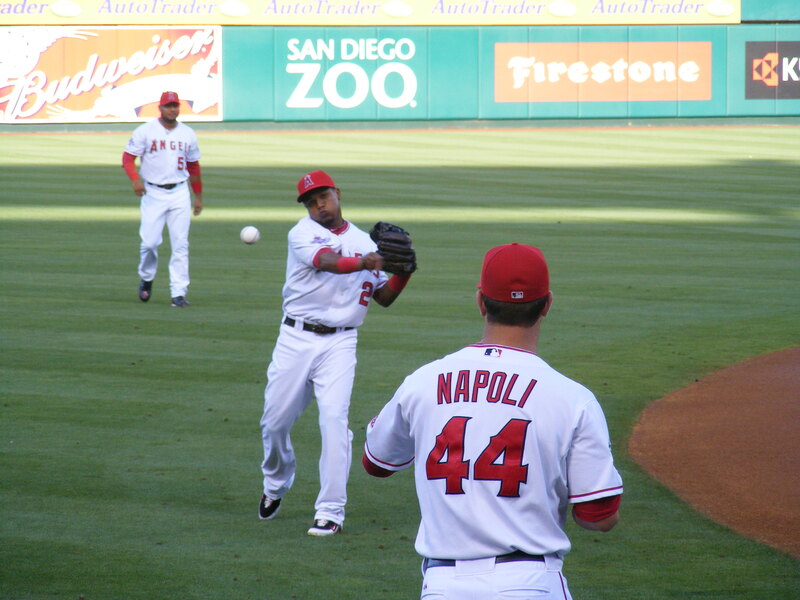 I wasn’t hallucinating… no, remember that in a previous post I mentioned that Bourjos and Howie Kendrick like to end their warmups by throwing knuckleballs to each other? 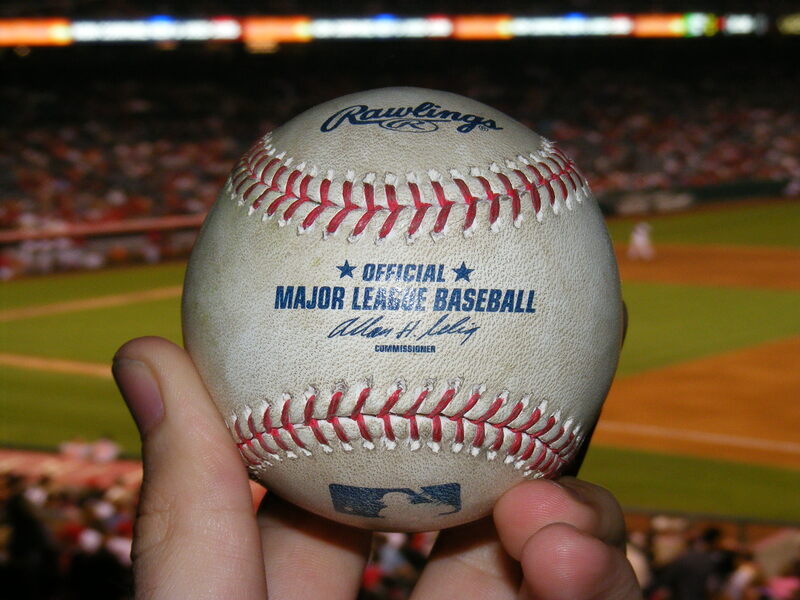 Well, a knuckler came flying in toward me–I pivoted, threw my glove up, and caught it… and looked to the field (to my left) to see Howie Kendrick there–he must have had another baseball in his pocket. Another interesting mark. 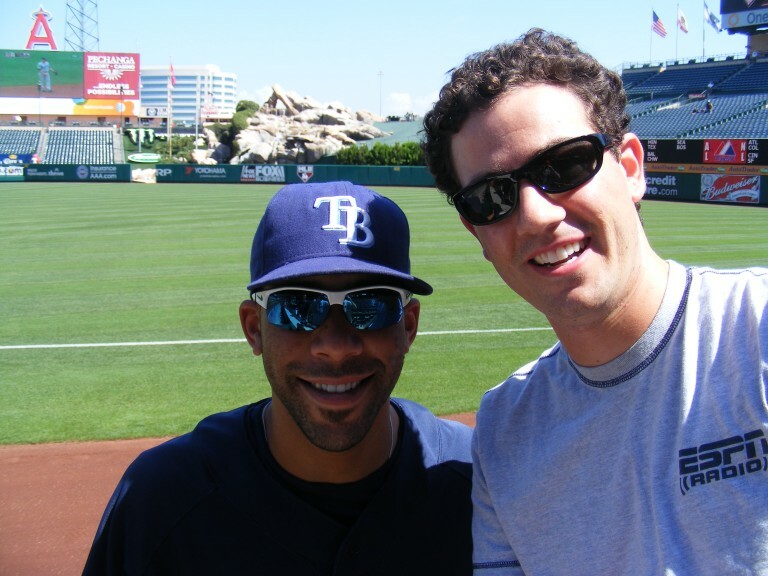 Thanks, Howie! I went back to the group again and we decided to watch the first inning or two from the seats we’d found, then get dinner, then head up to the view level (in potential foul ball seating). I like these seats because: 1) I snagged my first foul ball just to the left of this section and 2) the row in front of me was empty and in front of that row is a camera well where no one sits. 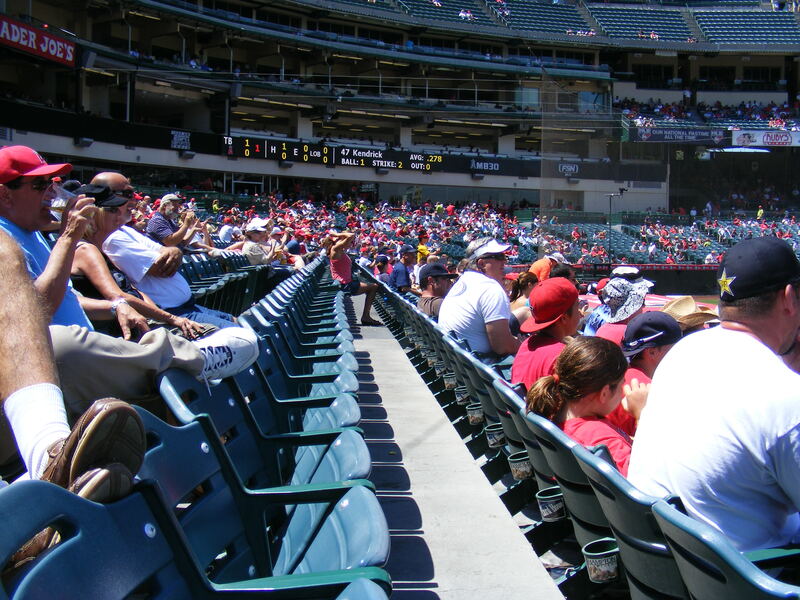 It’s the most empty space around in the upper levels in Angel Stadium. 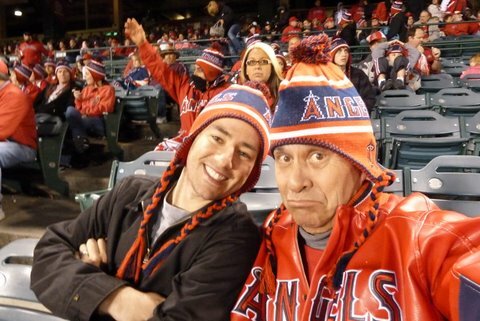 Well, to make a long story short, the Angels couldn’t score any runs… and the crowd was less than abuzz since the teams involved weren’t heading to the playoffs, and no foul ball came near us… though one ended up about two sections to my left. The score was 5-0 Baltimore by the time they’d batted in the eighth. At least we all got free candy jars as a giveaway item. 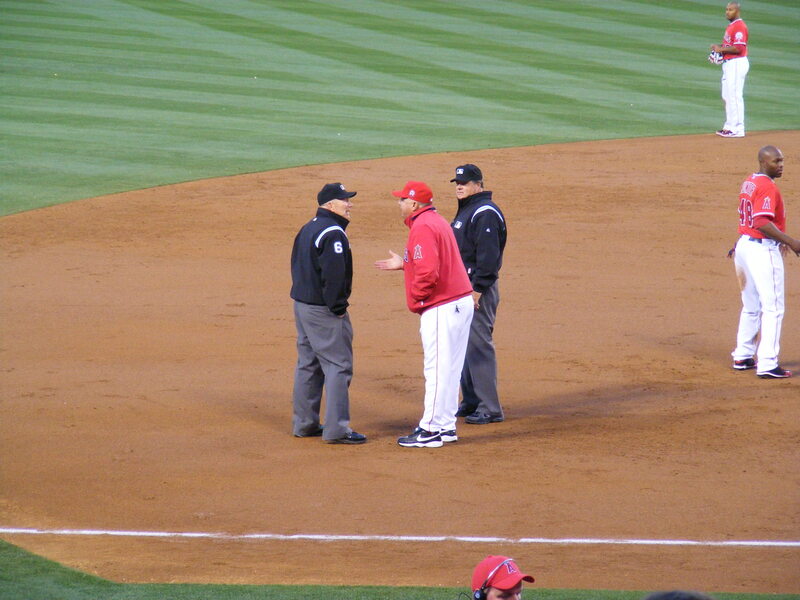 And I went for a third out toss at the end of the eighth. I made my way down near the Oriole dugout and when Alberto Callaspo grounded out to end the frame I stood up in my seat in the third row. 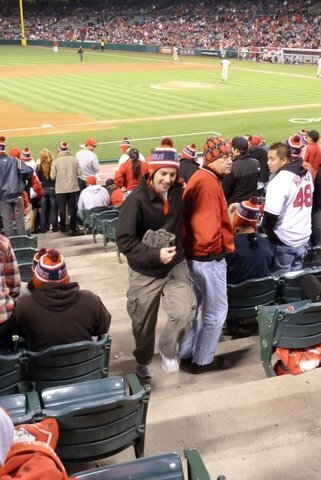 I’d been watching Ty Wigginton all night as Baltimore ran off the field: he wasn’t one of those first-basemen who tossed the ball to the front row… no, he threw the ball a bit deeper, and he seemed to be seeking fans that were on their feet. Sure enough, I yelled out, “Ty! Right here, man! 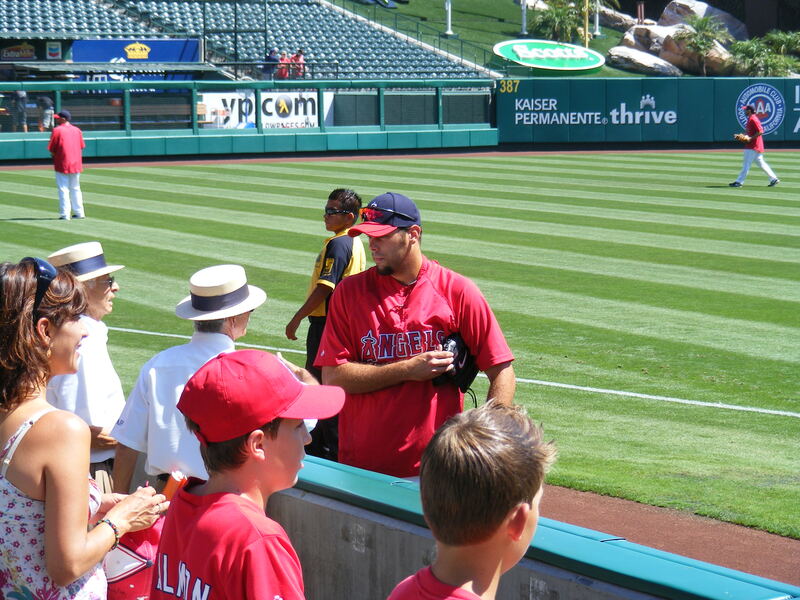 Ty!” And Wigginton fired the ball to me in the third row as all the little kids filed down to the front. 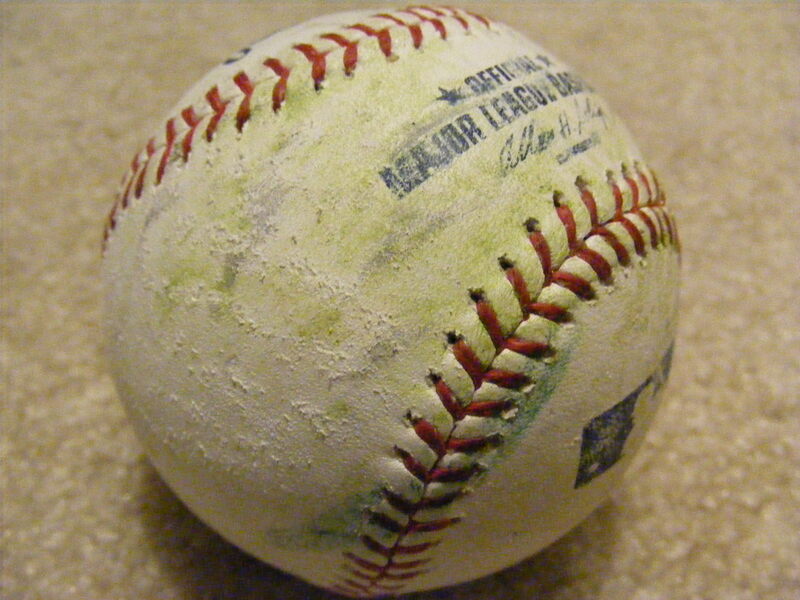 It was a beautiful, rubbed-up gamer. Thanks, Ty! The scoreboard told me there were over 43,000 fans at the game but by the ninth inning, down by five–most of them had left. I tried to get something post-game from the O’s but didn’t succeed. 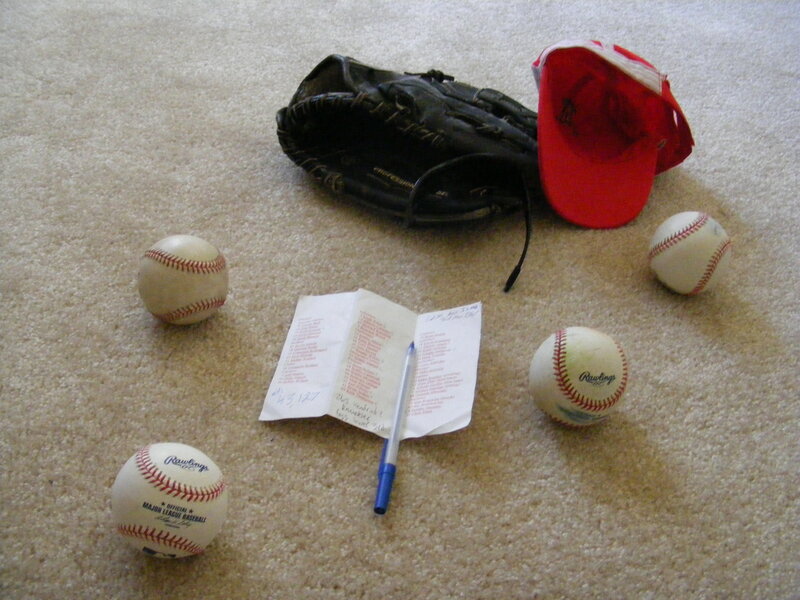 Oh, well… four baseballs, a candy jar, and a night with the family got me charged for the big move.